Saudi Arabia is bombing Yemen again, but the U.S. seems weirdly unconcerned. 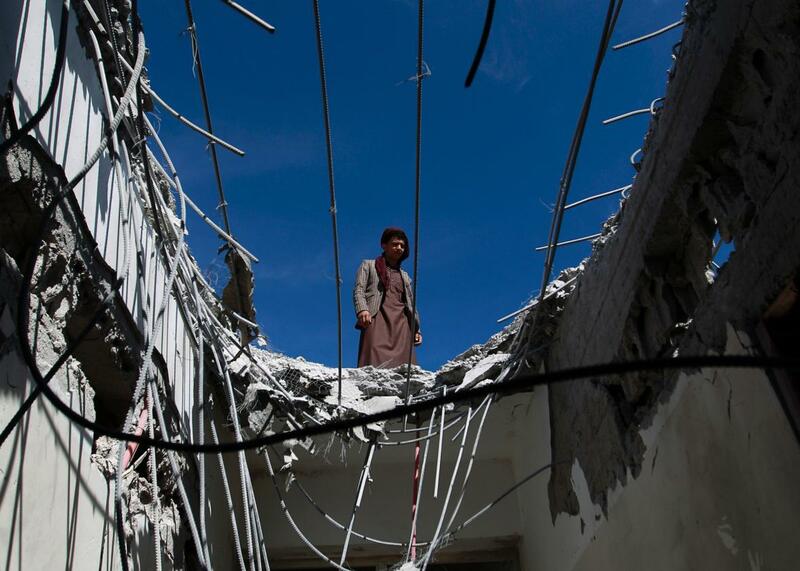 A Yemeni worker looks at the damage at the Noor Centre for the Blind after it was reportedly destroyed by Saudi-led air strikes in the capital Sanaa on Jan. 5, 2016. Amid all the other Mideast developments this week, the ongoing war in Yemen has been getting ignored. But as Bobby Ghosh noted earlier this week, we should be paying attention, because in addition to executing 47 people and setting off an international firestorm of protest and a diplomatic crisis with Iran, the kingdom of Saudia Arabia did something else huge on Saturday: It formally ended a cease-fire with the Houthi rebels in neighboring Yemen. The cease-fire had been in place since Dec. 15 as tentative peace talks began between Yemen’s Saudi-backed government and the rebels, but numerous violations had taken place. Now, heavy fighting has resumed, including intensified Saudi airstrikes, one that destroyed a care center for the blind in the capital, Sanaa. Several Saudi strikes have appeared to target hospitals and health centers, including a Doctors Without Borders facility in October. The Houthis have also launched new offensives in several areas this week. The air campaign by a coalition of Sunni states led by Saudi Arabia began in March, a few weeks after the Houthis took over Sanaa. The Houthis are Zaydis, a branch of Islam similar to Shiites, and the Saudis view them as an Iranian proxy, though it’s not clear how much influence Tehran actually has over the group. While there’s plenty of blame to go around, U.N. human rights officials say that the Saudi airstrikes bear the greatest responsibility for the nearly 3,000 civilians killed in the conflict, about half the total number of casualties. Extremist groups including al-Qaida and ISIS have also taken advantage of the ongoing chaos to expand their territory and influence. ISIS took responsibility Tuesday for a bombing that nearly killed the governor of the port city of Aden, which has seen some of the heaviest fighting. The relative silence about the conflict in Washington is unfortunate given how deeply implicated the United States is in the war being waged by its close ally. The U.S., which has carried out a covert drone campaign in Yemen against al-Qaida in the Arabian Peninsula for years, has provided tactical support, including intelligence sharing and refueling, to the Saudi campaign, despite worries that the high number of civilian casualties will increase support for extremists. In December, the U.S. sponsored a U.N. resolution drawing attention to the humanitarian consequences of the war. But these concerns weren’t enough to stop the State Department from approving a $1.29 billion sale of smart bombs to Saudi Arabia in November. Particularly in the wake of the Iran nuclear deal, the U.S. has been bending over backward to avoid antagonizing the Saudis. It’s possible that the administration has calculated that it’s worth letting Saudi Arabia have its way in Yemen in exchange for cooperation against ISIS in Syria. But even aside from the atrocious humanitarian situation, Saudi Arabia’s intervention appears to be exacerbating rather than calming the situation in Yemen. Given the number of terrorist plots directed against the west that have originated or been linked to Yemen over the years, it’s a little strange that this isn’t viewed as a bigger problem.